Who claims to be an ayam Cemani lovers? Are you the one? If your answer is yes, it means that you already know about this chicken. 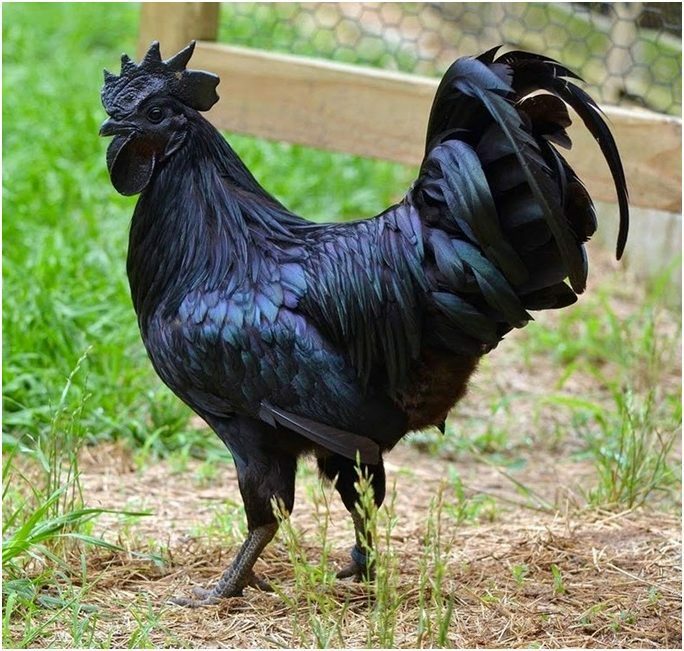 Ayam Cemani is from Temanggung, Central Java, Indonesia which has interesting characteristics because it has dominant gene that causes hyperpigmentation, causing it entirely black. Yes, that’s true. Its feather, beak, and its internal organs are black. When it is skinned, you can even see cemani chicken meat which is also black. This is why ayam Cemani is named so. The origin of its name comes from the word ayam which means ‘chicken’ in Indonesia, and Cemani which means ‘completely black’ in Javanese. Its amazing characteristics is just a reason why many people fall in love with it. Ayam Cemani is also one of the most expensive chickens in the world. Its beauty and exoticism has made this chicken known as the Lamborghini of the poultry. Everything about ayam Cemani is black such as skin, beak, feather, tongue, legs, toenails, flesh, bones, and what has been mentioned above, internal organs. How about its blood? Even though not black, but it is very dark in color. Then, what about the Cemani chicken eggs? Is it also black? Well, although everything about this chicken is black, but the only part of ayam Cemani which is not black is only its eggs. Ayam Cemani egg color is light brown or cream-colored. What should you know about cemani chicken eggs? The request of Cemani chicken eggs nowadays are increasing either to breed or to consume. There is misunderstanding about the color of the eggs. Many people think that because everything about Cemani is black, the color of egg is also black. Even, most of them also think that it has black chicken egg yolk. Cemani chicken eggs are actually not different with Free-range chicken (in Indonesia called ayam kampung) which has light brown or cream-colored. Therefore, people’s assumption about cemani chicken eggs which is black is untrue. What are the advantages of ayam Cemani egg yolk? It has no doubt that chicken eggs from any type of chicken are an excellent source of protein. And this is also what Cemani chicken eggs contain. The egg is relatively low in calories but high protein. According to some researches, 4gr of the total 5,5gr of protein per egg come from the egg whites. How about the egg yolk? What does it contain? Well, the yellow stuff in egg contains many important vitamins and minerals which are so beneficial to your health. It also contains lutein and zeaxanthin which are good for your eyes, and choline which is good also for your your brain and nerves. In Indonesia, cemani chicken eggs, both egg yolk and egg whites are believed in its advantage for menfolk to increase their stamina. Moreover, it can be consumed as supplement to boost immunity from disease attacks. 1. Egg is incredibly nutritious. It is among the most nutritious foods on the earth. 2. Egg is high in cholesterol, but it doesn’t adversely affect the blood cholesterol. 3. Egg raises HDL, ‘good’ cholesterol which causes lower risk of heart disease, stroke, and other health problems. 4. Egg contains lutein and zeaxanthin which is good for eye health. 5. Egg contains choline which is good for your brain and nerves. 6. Egg turns LDL or ‘bad’ cholesterol from small, dense to large, linked to a reduced risk of heart disease. 7. Egg has high in quality protein, with all th essential amino acids in the right ratios. 8. Egg doesn’t raise your risk of heart disease. It may reduce the risk of stroke instead. 9. Egg has low calories which can help you lose weight. Those all are what egg contains, and those are also what you will get from consuming cemani chicken eggs. Now you already know the incredible advantages of ayam Cemani egg yolk. Even though eggs are good for your health, it doesn’t mean without risk. Consuming eggs, however, can be bad for health when it is consumed in excess. So, keep your health by consuming eggs as your body need. Based on a research, don’t eat eggs more than 4 eggs in a week. We also provide ayam Cemani eggs for sale.